For those of you who have ever taken any writing/drawing instrument to a piece of paper of any sort and drew a representation of an environment for characters to explore, fight, live in, pass through, destroy, or otherwise interact with. Super secret lair of the Big Bad Evil Guy, (BBEG). And an infinite number of other locations from the endless imaginations of thousands upon thousands of role-players. For purposes of what might be included as a map; maps created using map generation software, (i.e. Campaign Cartographer), are welcome so long as they are original creations by you. After all they are home made. We ask that maps of this sort be converted to PDF or JPEG and uploaded that way. In other words it needn't strictly be a pen-and-paper creation to qualify for submission. If you do use a map generation software image, include a note to the Image Mods that it is your creation as there are stringent restrictions regarding 'no non-obscured map' for commercial maps. If you wish to keep a set of maps together, consider uploading them as a file. Many people will have questions about your maps so a few details entered into the comment for the picture are a great addition. If you have a lot of information to depart, make a comment in the forum under the picture and detail everything you want. I bought (another) copy of the [thing=44081][/thing] today in a charity shop - £1.50 (around the $3 mark). The box is used, but everything, including dice, is intact and in good condition. Inside were several scraps of paper with rough character stats and these maps! It was like opening a time capsule. I may even base an adventure around these maps some day. Finding maps! Very D&D, imho. 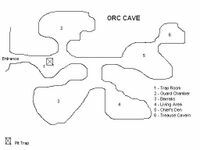 An Orc lair I made for a D&D 2nd ed. adventure. Includes room contents and encounters. I developed these (B&W) floor plans back in the mid 80s for a games clubs magazine, but they was not published, because the guy who did the magazine went to college.